I received a Philips Hue starter kit for Christmas in 2012, and it has become one of my favourite technologies in a long while. 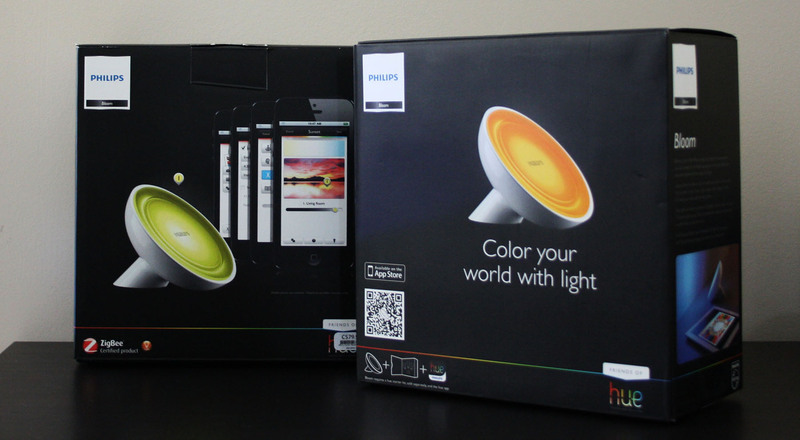 When Philips unveiled the Friends of Hue series at the beginning of August 2013, I was thrilled to expand my collection with new variety. It wasn’t until October when I finally purchased a set of Lightstips for behind my television. It looked great and I ended up getting another one for Christmas this year. The only piece left to complete the set was the second addition – the ‘LivingColors Bloom’ light. I ended up asking for one on my birthday and to my surprised received 2 of them. I already had an ideal placement for the first one so I was left to find a spot for the second. The final arrangement I’ve decided on works great – and now brings my light count up to 7. The Bloom is sleek, small, and delivers over 16 million colours all from the touch of a slider inside the Philips Hue app. It can be integrated inside any of the existing preset scenes, or created into a new one. By adding in a Bloom it gives a nice glow against a wall, or as an accent in a bookcase. The options are endless, all in an 8W LED bulb outputting 120 lumens. By using the two Blooms alongside the LightStrips behind my television I was able to create stunning scenes that are able to fill the room, or create a relaxing mood without having to even use the bulbs in my starter kit. Although with all 7 running at once it’s a wonderful splash of colour. Now that I have the full Hue set, I’m almost running out of room in my living area for more lights. I am however looking forward to seeing where Philips takes the Hue series from here, since they’ve done such a great job so far. I recommend the Bloom over the LightStrips if you’re just starting out, as they provide a little more versatility in my opinion. Note that they both require a bridge to function so you will need to invest in the starter kit or find a bridge second-hand first. The Bloom retails for $79.99 and can be found at Best Buy.